Roxanne appears in an aspect ratio of approximately 2.40:1 and in an aspect ratio of 1.33:1 on this double-sided, double-layered DVD; the 2.40:1 image has been enhanced for 16X9 sets. This was a perfunctory picture and no better. Definition tended to be mediocre. Close-ups showed reasonable clarity at best, and the rest of the movie seemed on the soft side. This wasn�t a terrible weakness, but the film lacked a sharp sensibility. Minor instances of shimmering and jaggies occurred, and I noticed light edge haloes. Print flaws were fairly modest, though; the flick came with an occasional speck but nothing major. Like the sharpness, colors were lackluster. Roxanne went with a nice, semi-pastel palette that seemed consistently flat and without vivacity. Blacks were a little drab, and low-light shots demonstrated passable clarity. The transfer showed its age and earned a �C-�. Don�t expect much from the lackluster Dolby 2.0 soundtrack, as is failed to deliver much dimensionality. The soundscape maintained a limited focus, as the side speakers mostly concentrated on music; the score and songs boasted nice stereo spread. Audio quality was mostly fine, though the track suffered from weak �secondary work�. Looping and foley sounded unusually fake. Take the scene where CD beat up the tennis jerks; the thugs made noises that didn�t vaguely match their mouths. Also, the sequence in which CD and Chris walked and talked showed iffy dubbing and foley. 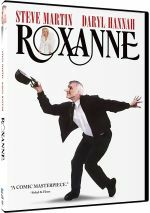 The disc includes a trailer for Roxanne. It includes no other supplements. Charming and affable, Roxanne works largely due to a strong performance from its star. 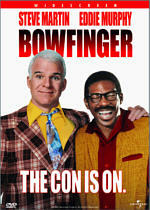 The rest of the movie fails to excel but it remains enjoyable enough. The DVD presents mediocre picture and audio along with virtually no supplements. I like the film but the DVD disappoints.